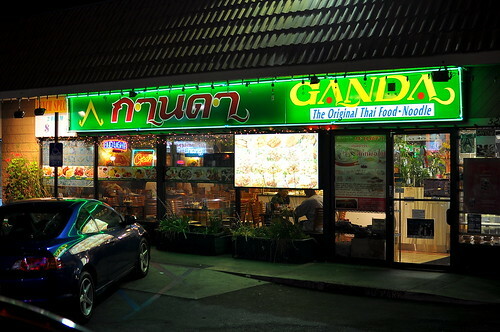 Heat lamps and steam tables don’t usually signal deliciousness, but expect the unexpected at Ganda Siamese Cuisine. Ever since Saveur magazine’s chief editor proclaimed the food served at this Thaitown spot to be “the most authentic Thai food in America” a few dozen issues back, I’ve been meaning to scope it out. Book research was just the nudge I needed to pass over my dependable darlings Ruen Pair and Pa-Ord and finally give Ganda a go. 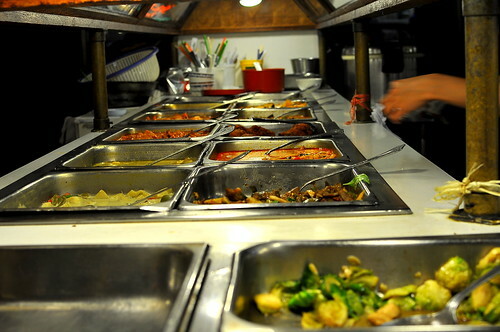 Chef-owner Sue Klinmalai rotates the selection of curries, braises, and stir-fries available each day, but expect to find two dozen or so dishes that are carefully made and intensely flavored. The array of offerings can be a bit daunting for the uninitiated, so feel free to ask the gals behind the counter for further details since most of the dishes aren’t labeled. For just under $20, The Astronomer and I were treated to one of the boldest, spiciest, and most deeply flavorful meals in town. 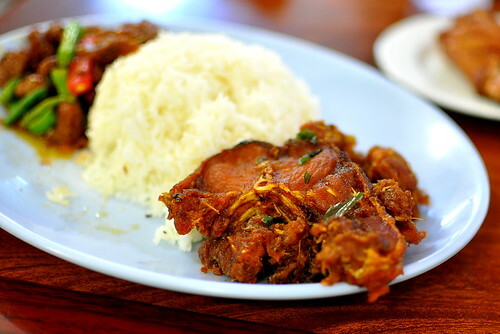 We shared a three item combination served with steamed white rice. 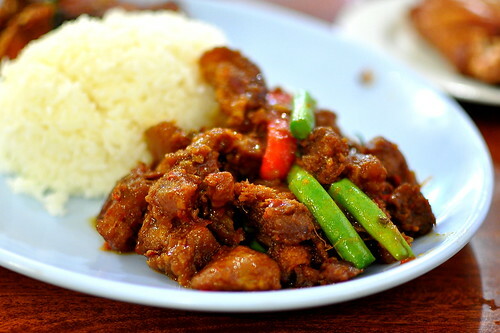 The crispy catfish (pla duk pad ped) is the restaurant’s most popular dish, and for very good reason. This central-Thai specialty, dry-braised in galangal, Kaffir lime leaves, and a plethora of spices, delivered on all fronts—crisp, sweet, savory, and spicy. The pork and green bean prik king, a dry curry with plenty of chilies and aromatics, packed an equally mean punch. 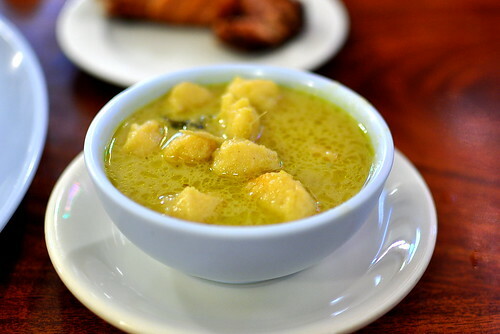 To round out our combination platter, we selected the green curry brimming with house-made fish balls. The broth was creamy, comforting, and mild enough to sip straight up, while the irregularly-shaped fish balls were wonderfully delicate. We also shared a link of made-from-scratch sour sausage. 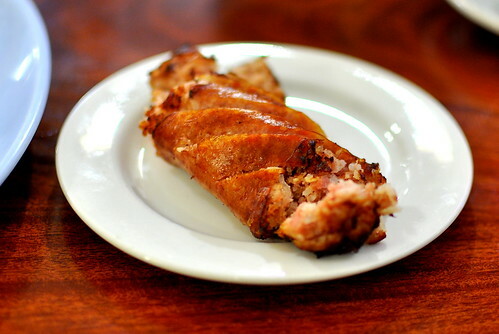 The innards were fabulously tangy; the skin snapped just so. 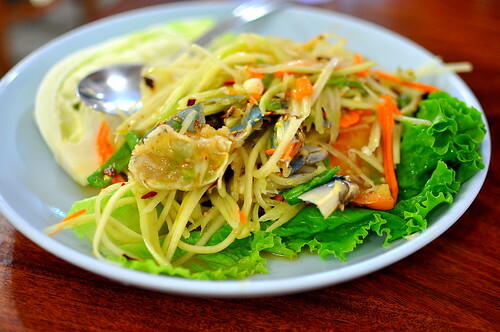 Rounding out our meal was a lush green papaya salad with raw blue crabs. The hunk of cabbage served on the side came in handy when the dressing got too spicy. Note to self: Request “mild” spicing when in Thaitown. Welcome to my Thaitown lineup, Ganda Siamese Cuisine! You’re well on your way to becoming a dependable darling. Just the sound of that catfish is making my mouth water. Guess I need to visit this place the next time I’m in town.